Being a full service Funeral Home Ahlgrim Family Funeral Service believes it is our duty to offer a full range of Funeral Merchandise and Services Every family we serve is different. They react differently to the death of a loved one and have different ideas concerning memorialization of a life lived. It is our duty to inform each family of their options and to discuss how our services can benefit their loss. Caskets: from Bronze to Fiberboard. Interiors from Crepe to Velvet. 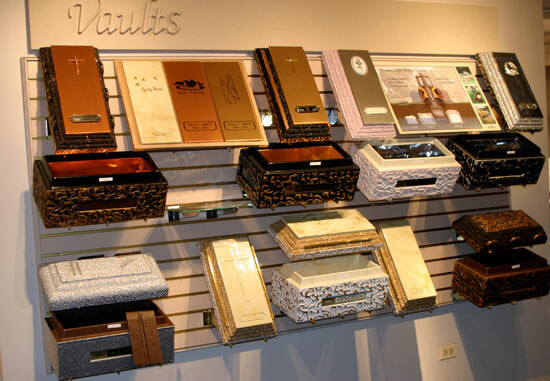 We work with many Casket manufacturers to provide a wide variety for our families. We have visited the manufacturing plants and understand how these Caskets are made and trust their craftsmanship. Vaults: A vault is what surrounds the casket in the ground. It provides a barrier between the ground elements and the casket. These can be sealed or unsealed. The birth of the vault was to provide protection to the casket from the ground elements and became stronger as the cemeteries began using heavy machinery to dig nearby graves. Vaults allow the ground to stay level and not collapse as this machinery is used. Click to see a short video on Why families choose a burial vault or Selecting a burial vault. Urns: Just like Caskets we use a few manufacturing companies to offer urns made from materials like Marble, Bronze, Stainless Steel, Wood, Ceramics and Cloisonné. Urns also come with Major League Baseball Team Logos. We also offer specific burial urns which may be required by certain cemeteries. Flowers: Our directors often order flowers for the family. This allows them to spend more time at home with their family. Flower shops provide a catalog of their designs for a family to choose from. Some families wish to customize their flowers pieces. We are informed as to how much they wish to spend and what kind of flowers they wish the florist to use. We then place the order and the costs become part of our contract. This gives the family one place to pay instead of receiving many bills weeks after the funeral. We order from local florists. This gives us the ability to know which flowers are in bloom and available. A local florist knows where were located, our procedures and building a good relationship insures excellent flower arrangements and the ability of rush orders. Pallbearer Gloves: These allow the Pallbearers to be set apart from the family members of guests. After the committal service, the Pallbearer are instructed to place their gloves on the casket which will be lasting tribute to the life lived. Tables: We are happy to provide tables during the visitation for the placement of mementos brought in by the families. Easels: We are also happy to provide easels for use during the visitation. Many families will bring in foam core boards made by family members. These are usually a collage of pictures of life. Register Book: This is a book that family and guests will sign when attending the visitation or services. Our book has a special line labeled address so families are sure to receive all the information allowing them to send a thank you note. Many books do not have a labeled line and most guests won’t think to place their address if not reminded. Prayer Cards: We print many different types of Prayer Cards. These are a single card with a picture on the front, such as a saint or meaningful photo, and the deceased name and information on the back. Custom Prayer Cards can be printed with a picture or an extra special prayer. Memorial Folders: As the name implies, this item is folded in the center. This allows for a picture on the front cover, a prayer on the inside of the front cover and the service information on the inside of the back cover. Acknowledgement Cards: Providing many types of acknowledgement cards gives each family a chance to fide a card that fits their individuality. These are designed to send to some one after the funeral services thanking them for their attendance, gift or thoughts.